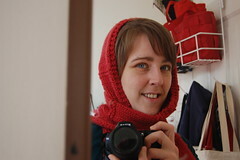 Hooded scarf, knit for Mom’s birthday. Pattern is Hooded Scarf from Misti International (uh, minus the bizarre pompoms), yarn is Knit Picks Biggo in Carnelian Heather. 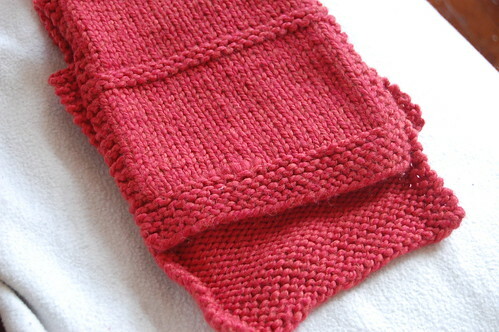 And here’s a Ravelry link for anyone interested. This was a super fast project, though you wouldn’t know that for how long it took me. I have a bad habit of setting knitting aside and not getting back to it as quickly as I should. I also ran out of yarn twice while working on this & away from home. Poor planning on my part, but these big chunky yarns take up a lot of space! Biggo was a dream to work with. Very soft and easy, and it held up beautifully in the washer & dryer. This unfortunately did not get a proper block, so the edges of the scarf portion are rolling inward on themselves (however, that’s also how it came out of the dryer, so, it’s probably not something I can do much about. Either way, I’m not too worried about it as the recipient was very pleased.